Remarkable LOG HOME with 1, 568 sq.ft. 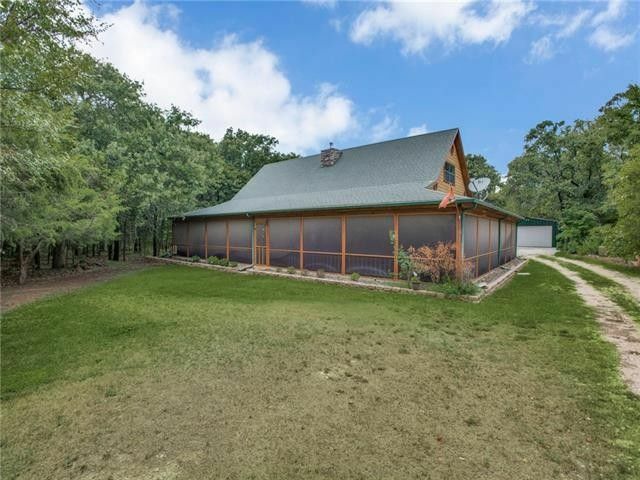 WRAP-AROUND SCREENED PORCH-- within 2 acres of mature oak trees at the end of a CULDESAC LOT. Backs to Corps of Engineer Property, Lake Ray Roberts! Floorplan includes 5 bedrooms, 4 full baths, 2 living rooms, & 2 dining areas.Vaulted ceilings in Great Room open to kitchen & dining. Kitchen includes island bar, granite countertops, double convection ovens, stainless appliances. 1st floor Master with updated bathroom, sitting area, & walk-in closet. Three bedrooms & 2 full baths on first floor! Two bedrooms with walk-in closets & 2 full baths upstairs plus MEDIA-GAMEROOM with refreshment center & lots of built-ins.Covered patio with hottub & private half-bath. DEER & BIRDS! Directions: From I35, exit and go East on 922, turn right on Blackjack Road, turn left on Bloomfield, turn left on Sleepy Hollow. Home is on the left near the end of the culdesac.